This week I had the privilege to take part in New England Reading Association’s Author & Illustrator Night at the Holiday Inn by the Bay in Portland. Folks, it was a bibliophile’s dream! I walked into the banquet room to find the perimeter lined with tables at which were seated over two dozen of Maine’s most influential children’s book authors and illustrators, all waiting to talk with me! A trifecta of talent! 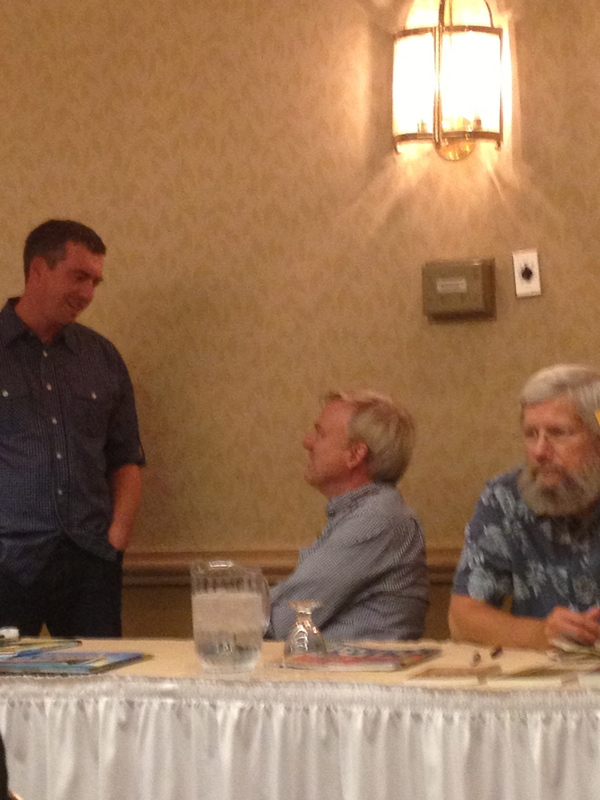 Matt Tavares, Chris Van Dusen, & Paul Jeneczko at NERA! 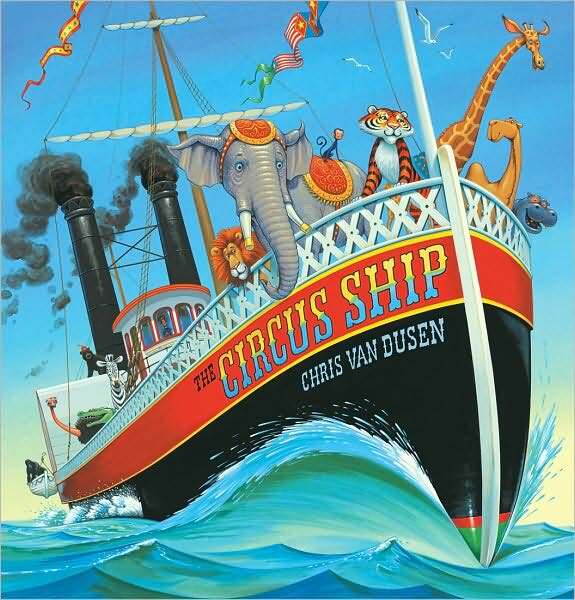 The Circus Ship, written and illustrated by Chris Van Dusen is a book that’s been on my radar for awhile. Van Dusen tells a masterful story in rhyme about a ship, full of circus animals and their greedy owner, that has an unexpected wreck and sinks. The animals make their way to an isle off the coast of Maine and the islanders and animals learn to coexist peacefully until the owner shows up and wants them back. I never knew the true story upon which this tale is based, but in the author’s note, Chris describes the research he did on The Royal Tar, a steamer ship that was carrying a circus, its band, and a total of 103 passengers that crashed off of Vinalhaven in 1836. While this book is based on that account, it is not a retelling of it… which just goes to show how tightly reading and writing are intertwined; the reading of one story can lead to the creation of another! You’re Wearing THAT to School?! 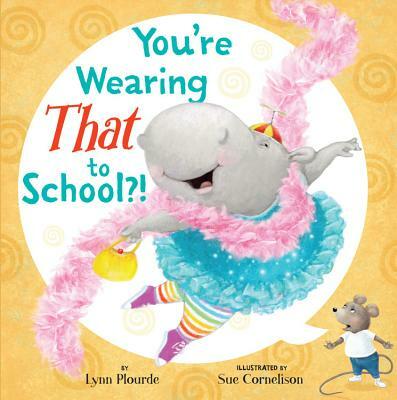 written by Lynn Plourde and illustrated by Sue Cornelison is a charming book about Penelope the hippo, who is so excited for her first day of school! Her enthusiasm about her special outfit she’s picked out, her special lunch, and her special stuffie for show-and-tell is quickly dashed as her best friend, Tiny the mouse, explains to her about how it’s better to blend in at school rather than stand out. Penelope must decide if she will remain true to herself or try her hardest to fit in. 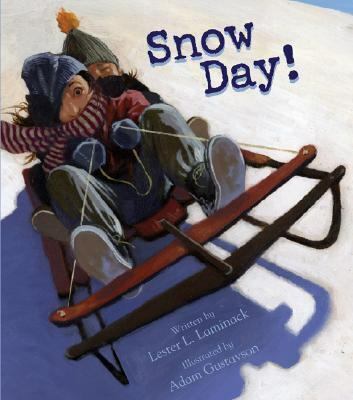 This is a great primary level read for a fun way to discuss peer pressure and truly expressing yourself! 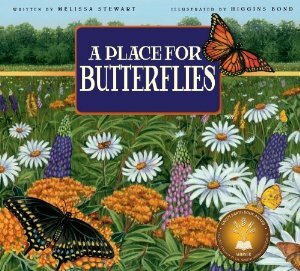 A Place for Butterflies, written by Melissa Stewart and illustrated by Higgins Bond is a book with which I was unfamiliar before last week. It was the recipient of the Green Earth Book Award, which is awarded annually by the Newton Marasco Foundation. This book is absolutely amazing! The inside covers of the paperback edition contain maps for where certain types of butterflies can be found. 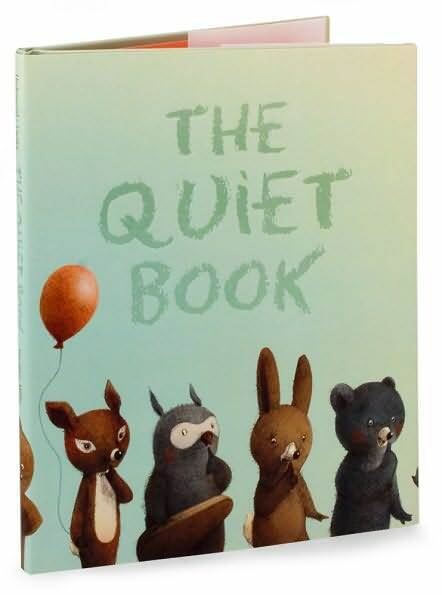 The main text is easily accessible for kids to read on their own or it can be used as a read aloud as well. There are sidebars on each two-page spread which describe different types of butterflies. Higgins Bond has done a STUNNING job with the illustrations in this book! I would highly recommend it if you are doing a Science unit on butterflies or simply want an excellent example of nonfiction text to add to your classroom’s library. www.melissa-stewart.com is the author’s website. It is a whimsical place to visit, with activities for teachers and kids! 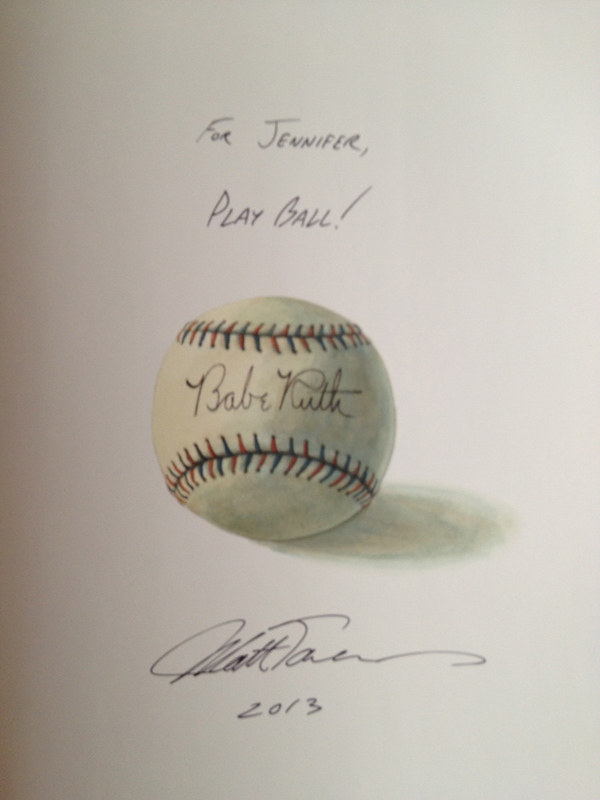 Becoming Babe Ruth, written and illustrated by Matt Tavares, was a book that I admit, I initially had some hesitation to read. As a matter of fact, I shared with Matt on Thursday that it was the ONLY book of his that I had not yet read. Why? Well, you see, I’m a lifelong, fourth generation Red Sox fan, and when someone mentions The Bambino to a fan from Boston, we tend to get a bit on edge. After all, some say it was the Curse of the Bambino that kept the Sox from winning the World Series for 86 years… but I digress. I’m glad I did finally read it, however, because Tavares has done a magnificent job of telling the story of a orphan boy’s troubled childhood and the mentor who helped him become (arguably) one of the greatest baseball players of all time. Matt includes a comprehensive author’s note at the end that is not to be missed, as it describes his research process and more of the back story behind the story that he told. As always, Tavares’ illustrations are exceptional and add so much to the tale he tells. The best part about my experience at last week’s authors and illustrators night was the fact that these were all people from Maine who make great contributions to the world of children’s literature! We are fortunate to have such wonderful literary treasures in our midst! This book is a teacher’s and/or librarian’s dream! Granted, due to school being back in session, it took me a little longer to finish than I would have liked, but it was well worth it! This well-crafted cross between “Willy Wonka & The Chocolate Factory” and “The Phantom Tollbooth” (both of which are mentioned in this text!) tells the story of 12-year-old Kyle Keeley, who wins a chance to participate in his new local library’s overnight lock-in. Little does he realize that getting in proves to be much easier than getting out! In order to “escape,” he and his teammates must piece together clues to solve puzzles, all while facing challenges and trying to beat the clock to get out and reap some great rewards. The biggest reward, however, may simply lie within the pages of a good book. Adults and older students alike will delight in all the literary references sprinkled throughout the story, which breathes new life into the Dewey Decimal System like never before! This book definitely deserves a reread in order to find and solve all the clues that weren’t found on the first time through. As Mr. Lemoncello says, “Knowledge not shared remains unknown.” Share this wonderfully fun story today! Happy “New Year” to all my colleagues heading back to school this week! I am excited to share my summer reads list with colleagues and students and I can’t wait to hear all about theirs! I’ve recently picked up a text again that I bought last spring, the second edition of “Apprenticeship in Literacy: Transitions Across Reading and Writing, K-4” by Dorn & Jones. I was a fan of the first edition and it was a foundational text in my coaching training six years ago. I’m happy to report that I’m an even BIGGER fan of the new edition! Dorn and Jones have expanded their work to include middle grade learning through grade four. This is fantastic news for those of us looking to bridge their great work in the first edition if AIL and Dorn & Soffos’ text, Teaching For Deep Comprehension, which is aimed at older students’ literacy development. AIL’s new edition is so much more comprehensive in its scope and sequence and I was delighted to see the importance they placed on instructional language. 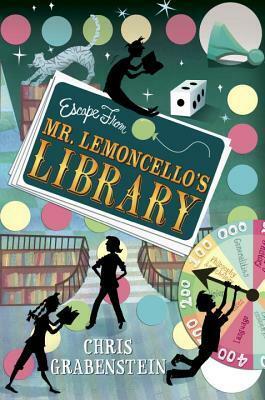 I’m also reading “Escape From Mr. Lemoncello’s Library” by Chris Grabenstein. This is going to be a great addition to libraries everywhere! The main character, Kyle Keeley is a 12-year-old who’d rather spend his time playing games (board, video, and otherwise!) than reading. But after getting grounded, Kyle figures winning the essay contest to spend a night in his town’s new high-tech library could be just the ticket to getting some of his screen time back. I can’t wait to see how it ends!!! As I was reading through recent tweets from folks I follow and I found an interesting hashtag: #PB10for10. ANY Pete The Cat book is sure to delight kids and will leave catchy songs stuck in your head for days! My third graders’ two favorites are Pete the Cat: Rocking in My School Shoes and Pete the Cat and His Four Groovy Buttons. Teachers or parents, do you have a reluctant writer on your hands? This book is for you! 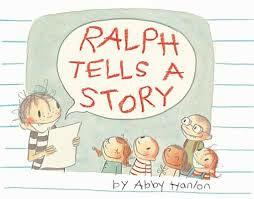 Author Abby Hanlon writes this humorous narrative about Ralph, a writer who can’t find a good idea about which to write a story. It seems, to Ralph, that everyone else can write great stories about anything, but he thinks all his ideas won’t make good stories at all. Ultimately, Ralph overcomes his writer’s block in a most amusing way! 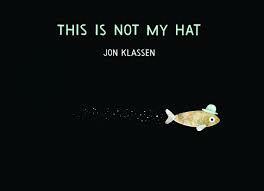 Jon Klassen has followed up his hit, “I Want My Hat Back” with this year’s Caldecott winner, “This Is Not My Hat.” When I first shared this with my students during the week that the Caldecott Award was to be decided, I read it to them without showing them the illustrations. One student’s response captured my purpose perfectly. She said, “I really hope there are some awesome pictures in this book because the words don’t paint a very good picture in my head!” Enter reading #2 –with pictures! I can’t accurately describe the level of emotion that was created as students took an underwater journey with a smll fish and a stolen hat… If you’re looking for a great example of how illustrations can carry a strong message in a book, this is it! 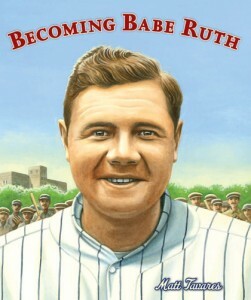 As picture book biographies go, this one is a must! 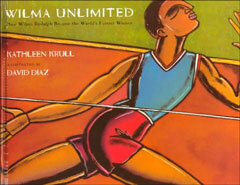 The true story of Wilma Rudolph and her life before she became the fastest woman in the world is sure to engage readers of all ages. 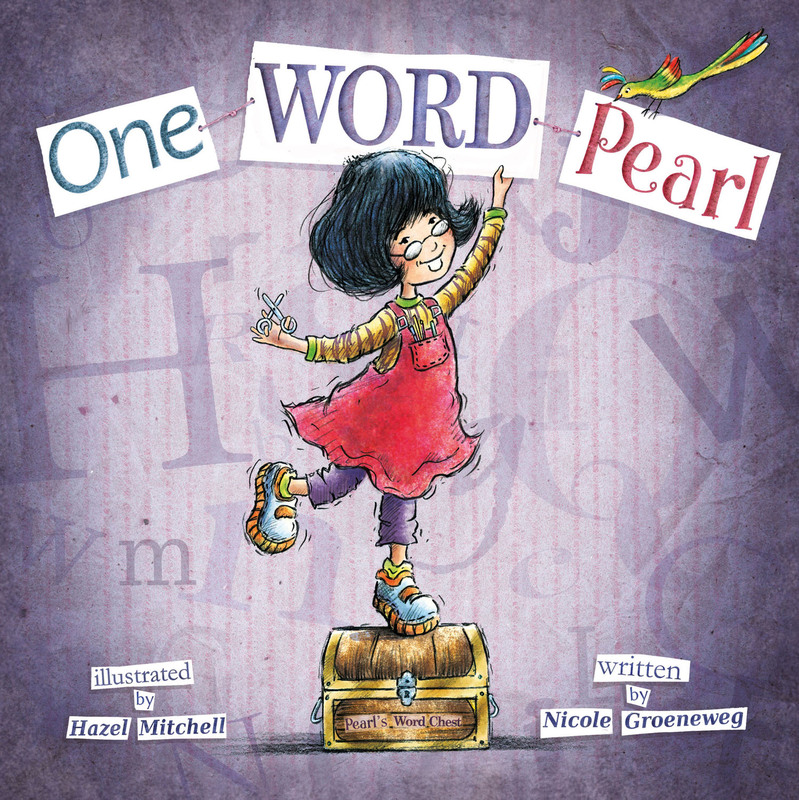 This is a book that I have used in the classroom for several years and students continue to be amazed at her tenacity, perseverance, and courage. I would recommend sharing this as a read aloud in two separate periods with younger readers, due to the length of the text. A new favorite that I introduced to my class last year and will continue to recommend is Peter Reynold’s “The Dot.” I can totally relate to this book because my artistic ability is well, less than stellar. The main character, Vashti, feels the same way until her teacher encourages her and a small dot leads to great inspiration! A great gift for the art teachers in your life, too! NOTE: International Dot Day is September 15th! 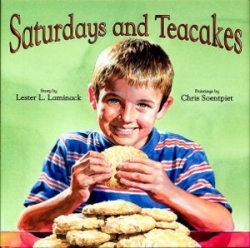 My last 3 picks for my PB10for10 this year are all by the same author, Lester Laminack. You won’t regret it! I’ve had the privilege to hear him speak several times. Lester’s ability to tell a story is amazing! I would also recommend any and all of his professional development books for teachers. 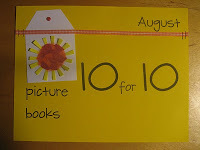 So that’s it for this year’s PB10for10! I look forward to your comments and perhaps hearing what YOUR picks would be if you had to narrow it down to just ten! Thanks to a great recommendation by my friend (@literacydocent), I was lucky enough to find several copies of series books by Jake Maddox during my recent trip to Bull Moose Music (which, by the way, is the BEST kept secret in children’s books! Wait- did I just shoot myself in the foot?!) 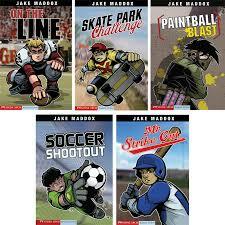 Anyway, the Jake Maddox series is a great entry into early chapter books. They are high-interest sports-based books that boys and girls alike are devouring! I’ve test-driven them during my summer reading transition program where I’m working this summer and all the kiddos agree- Jake’s books are a hit! Lots of white space, decodable text, and relatable storylines! A great series to introduce to reluctant or dormant readers! 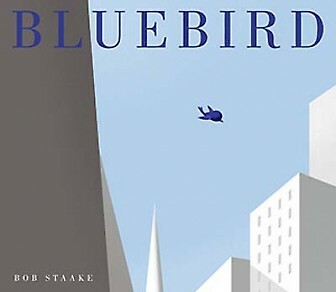 My next greatest discovery, which has been on my TBR (To Be Read) List for awhile now, was “Bluebird” by Bob Staake. This wordless book literally moved me to tears. A testament to friendship, loyalty, and hope, this text would make a great pairing with so many wonderful texts on the topic of bullying and true friendship, in particular. I can’t wait to share this book with kiddos this year. It has the potential to spark some powerful conversations for readers of all ages. 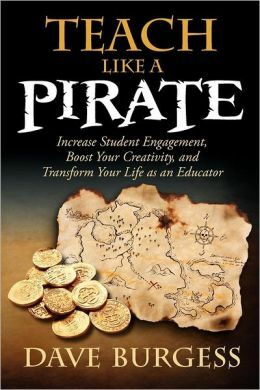 I have been so excited and inspired by my newest professional book, “Teach Like a Pirate: Increase Student Engagement, Boost Creativity, and Transform Your Life as an Educator” by Dave Burgess! Educators, if you are looking for a great text to fire you up for the upcoming school year, you definitely need to check out this title! There is so much talk about this book out there in the “twittersphere,” that there are multiple weekly TLAP chats for English, Science, and Humanities teachers, along with a general TLAP chat, in which I take part each week. I’m jazzed to begin my virtual book group, as well as perhaps facilitating a book group in my school communities with this text as soon as possible! That’s my reading week so far… What does yours look like? Several months ago I began to experience excruciating back and leg pain and, at the time, I was sure I had just overdone a workout; if I rested, it would be ok. As it turned out, I was diagnosed with degenerative disc disease. I continue to see a chiropractor on a regular basis, who has truly been my salvation through all of this. I can’t say there have been many times in my life when I was not able to muster a sliver of a positive outlook, but since March, there have been days I thought I would NEVER be pain-free again. It was intense and constant… unrelenting. I just wanted to give up and didn’t see how I would be able to continue carrying on with my regular life. I felt utterly hopeless. In my role as a literacy coach, part of my work is as an interventionist. I have seen hopelessness in the eyes of students who struggle, students who feel no reprieve. As teachers, we often feel the need to paint the “big picture” for our students. Don’t get me wrong, it is important for kids to have a sense of why they are learning certain things. Instruction without a sense of authenticity is shallow and does not encourage students’ real world connections. However, if we constantly focus on the “big picture,” we may miss some crucial scaffolds along the way. We may inadvertently undermine our instruction. After learning of my condition, several of my friends and colleagues asked what my doctor’s long-term plans were for me to be healthy and remain pain-free. Would I eventually need surgery? What would the ‘end result‘ be? I very politely told them that my chiropractor’s mantra to me through all of this has been, “Let’s work together to get this immediate situation under control so that your pain is managed. Then we’ll talk about long-term plans.” My doctor knows that we must focus on the many little steps that need to build upon one another first before the big picture will even seem attainable. For that, I am grateful. When one is that overwhelmed, and the focus remains just on an end result, it’s easy to overlook and forget to monitor the little steps… the small points of progress that slowly give us back our hope. 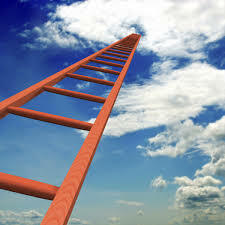 Oftentimes, I think it is in our urgency to have our students “arrive” at a particular benchmark, standard, or number on a rubric, that we might tend to place more distance between the “rungs” of our scaffold ladders, thinking it may get them there faster, yet if the distance becomes too great, they are unable to reach the next level of success. One example of this is the guided practice component of a workshop framework. This component of a gradual release of responsibility model cannot be overstated. Yet it is a component which is sometimes eliminated, for the sake of moving on to independent practice. Likewise, we can’t simply think that by providing merely one opportunity to practice the task modeled in the mini-lesson, that it will always be sufficient for the majority of learners. Repeated over time, this will also reinforce our struggling learners’ belief that they will never attain the end goal, (the “big picture.”) The time invested in guided practice will ultimately reap more independent gains. “It is tempting to make a list of all the concepts and skills that our students need to learn and check them off as we teach them. But, these strategies are complex, and we expect our students to use them all their lives. We can’t expect children to be able to use these strategies independently, without support, after just a few lessons. As teachers, we work to design whole-class, small-group, and individual experiences that model and scaffold our students’ learning and give them the time they need to develop independence” (p. 74). I’m getting better. I was at the point of being pain-free for over three weeks before I decided that I would increase my level of independence and try a day of canoeing over Independence Day weekend. (Ironic, I know!) Did I have a setback? You bet. I had completely forgotten how many back muscles (and the demands of controlling those muscles) are involved in that activity. My chiropractor did what great teachers do: he reminded me that I needed more practice with the little steps, such as balancing, building my stamina, and utilizing the right tools in order to be successful. I had taken away my own scaffolds too quickly because I was too focused on only my ultimate goal rather than what needed to be in place for it to be achieved. There’s a good reason it’s called the GRADUAL release of responsibility. I think my favorite book of the week was Lynda Mullaly Hunt’s, One For the Murphys. This book was recommended to me by a dear teacher friend and what a great recommendation it was! The main character, Carly Connors, is a 12-year-old girl who unexpectedly finds herself placed in a foster home when her mother is unable to take care of her. The Murphys are the quintessential all-American family, which makes Carly resent being with them even more. This heartwarming story of trust, honesty, and love is sure to bring more than a tear or two to readers. One For the Murphys is somewhat reminiscent for me of Cynthia Lord’s Touch Blue, however where Lord’s story is told from the perspective of one of the siblings in the foster family, Lynda Mullaly Hunt tells the story through the voice of the foster child herself. These two texts paired together would work well for a study on point of view with intermediate students. While browsing in one of my favorite Indie bookstores last week, I stumbled across an AUTOGRAPHED copy of the Caldecott Honor book, Creepy Carrots by Aaron Reynolds. I was pleasantly surprised at this fun and humorous picture book about Jasper Rabbit who loves to eat carrots from Crackenhopper Field. He eats them morning, noon, and night until one day things take a turn for the “very creepy!” Peter Brown’s black and white illustrations, with a bright pop of orange, add to the tone of the text. Can’t wait to share this one with my first-third grade friends!